A few months ago, Mozilla added the option to set aside tabs for later to its Firefox Test Pilot program. They call the feature Snooze Tabs. Test Pilot is Firefox’s opt-in platform that lets willing users try out experimental features. Participants add such features to their Firefox installation so the Test Pilot Team can gather useful data. 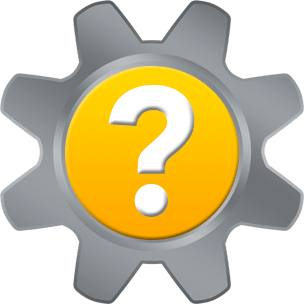 Once gathered, the team could potentially push a test feature out into production. 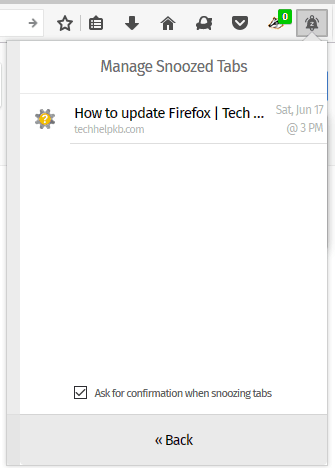 After completing a four-phase lifecycle process, Firefox may add the option to snooze tabs for all Firefox users by default. But why wait? 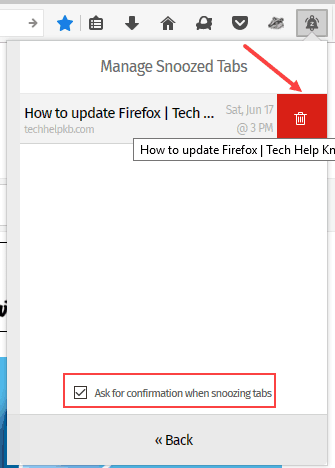 Although Mozilla released a substantial update to Firefox this week, the Snooze Tabs feature still remains snug in its test bed. Much like slamming the snooze button on your alarm to buy some extra sleep time, Snooze Tabs lets you set aside specified tabs until later. How many times have you encountered interesting content that you don’t have time to read? You can’t let it distract you or take you off task. There are cumbersome ways to save a link for later, like an Evernote, Pocket or browser bookmark. But for every such bookmark you create, you will need to delete it at some point. 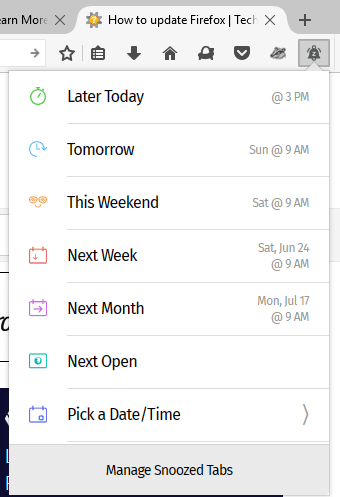 The option to snooze tabs in Firefox lets you schedule the return of the content for when you have time to focus on it. To get started, launch Firefox and install Firefox Test Pilot. 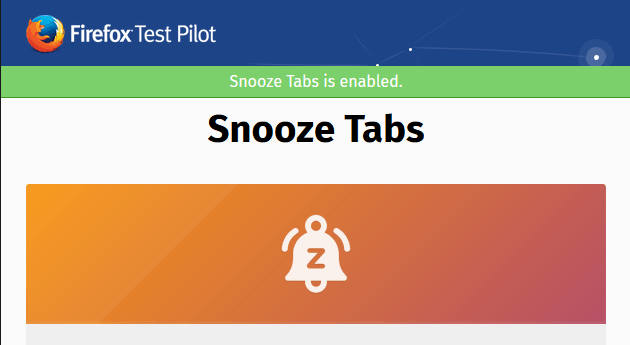 Kill two birds with one stone by installing Test Pilot and enabling Snooze tabs at the same time. displays in the Add-on Bar. To snooze the tab you are visiting, click the Snooze Tab icon in the Add-on Bar. Select how long you want to snooze the tab from the feature’s menu. In this example, we selected Later Today @ 3 PM. In the snooze tab confirmation, click OK. The snoozed tab will close. Tick the Don’t show this again check box in the notification bar if you do not want to see a snooze tab confirmation next time. When a snoozed tab relaunches, the tab’s favicon will temporarily display the Snooze Tabs icon so you know this tab re-awakened. A notification also displays in the task bar notification area when a snoozed tab has re-awakened. To manage your snoozed tabs, click the Snooze Tabs icon > Manage Snoozed Tabs. Hover over the link for a tab you snoozed. 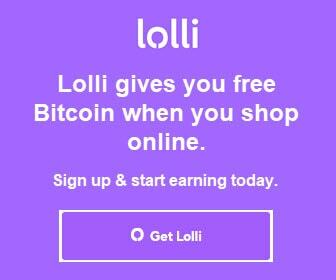 Left-click to visit the page immediately, or click the Delete icon to remove it. You can also restore the snooze tab confirmation from this view. To disable Snooze Tabs if needed, return to the Snooze Tabs page, and click the Disable Snooze Tabs button. Thank you for visiting Tech Help Knowledgebase to learn how to snooze tabs in Firefox. If you liked this article, follow us on Twitter @techhelpkb and subscribe to our YouTube channel to keep in the loop.